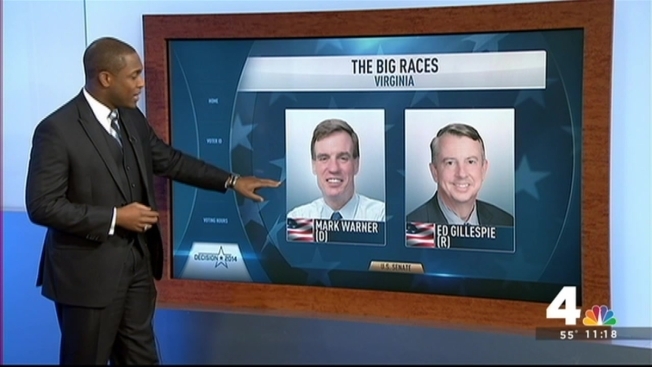 Virginia voters will have to bring a photo ID to vote on Tuesday -- but that ID is not required to include the voter's address. Several different types of photo ID are acceptable, including a driver's license or other ID issued by the state Department of Motor Vehicles; a U.S. passport; an employer-issued ID; a student ID from a college or university in the state; a photo ID card issued by the federal, state or local government; and a state-issued voter photo ID card. Your ID does not have to list your address, just your name and photo. Here's a complete list of accepted IDs. People who don't have one of those forms of ID can get a free voter photo ID card from their nearest Voter Registration Office. Find out how you can get your photo ID here. Voters can apply for a Virginia Voter Photo ID Card throughout the year, according to the Virginia Department of Elections. The ID will be printed and mailed to the applicant's address, but when an election is fewer than 21 days away, voters can receive a temporary identification document at their voter registration office. Citizens may use that document to vote. Those who arrive at their polling places without proper ID can still cast provisional ballots. Such voters will have until noon on the Friday after the election to deliver a copy of their photo ID to the voter registration office, which they can submit by fax, email, in-person, mail or commercial delivery service. People casting provisional ballots can also apply for a Virginia voter photo ID card by noon of that Friday. 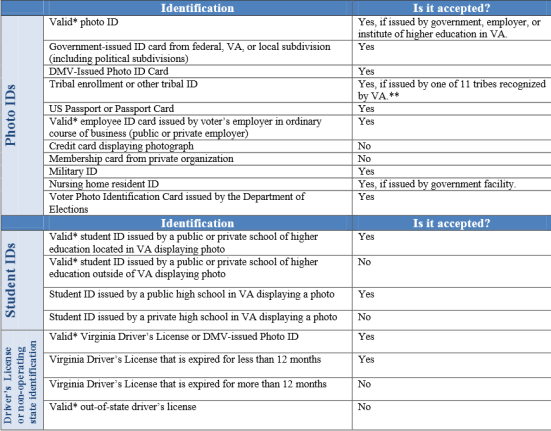 The Virginia Department of Election has a PDF chart online showing acceptable forms of ID; voters may want to print it out to have a copy handy.